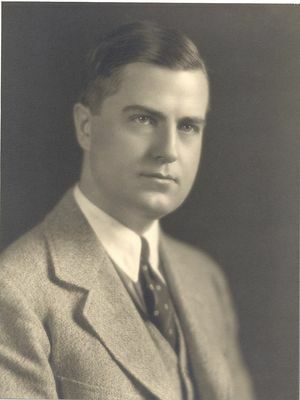 Charles Stuart Ballantine, IRE President, 1935, discovered the antenna effect in coil-type systems, and he invented the capacity compensator for these systems. Born on September 22, 1897, at Germantown, Philadelphia, Pennsylvania, Mr. Ballantine's interest in radio developed from a boyhood hobby to a life work. He was educated at Drexel Institute, and in the Graduate School of Harvard University, specializing in mathematical physics. During the first World War he served as an expert radio aide in the Philadelphia Navy Yard, where he had charge of the development of the Navy coil-type compass, a forerunner of radar. He discovered the "antenna effect" in coil-type systems and invented the capacity compensator for its control. In 1923 he was awarded the John Tyndall Fellowship in physics at Harvard University. At this time he developed the principle of negative feedback to stabilize and reduce distortion in transmission circuits, modulators, amplifiers, and detectors. Mr. Ballantine engaged in extensive studies of detection at high signal levels, fluctuation noise in radio receivers and tubes, development of technique for sound measurements of loudspeakers and receivers, microphone calibration, and broadcast receiver design. He invented a method of stabilizing radio-frequency amplifiers by means of a Wheatstone-bridge circuit, and in 1929 made important contributions to the design and use of vacuum tubes for radio receiving sets, later improving condenser microphones in such a way as to permit increased fidelity in the transmission of sound programs. One of the most widely known of his many contributions to radio was his invention of the first "throat microphone" to pick up voice sounds directly from the larynx, a device of major importance to aviators, later widely used by the Army Air Force. He founded the Ballantine Laboratories in 1934 and was its president until his death. Mr. Ballantine joined The Institute of Radio Engineers as an Associate in 1916 and transferred to the Fellow grade in 1928. He organized the Philadelphia Section of the Institute in 1920, acting as its chairman until 1926. He served on numerous committees of the Institute, and was its president in 1935. He was a member of the Franklin Institute, the Radio Club of America, the American Institute of Electrical Engineers, and the American Association for the Advancement of Science. He was also a Fellow of the American Physical Society and the Acoustical Society of America. He was awarded the Morris Liebmann Memorial Prize by The Institute of Radio Engineers in 1931 for his outstanding accomplishments in acoustical and electrical inventions, and in 1934 he received the Elliott Cresson Gold Medal from the Franklin Institute for his work on vertical-antenna radiation. Mr. Ballantine was a brilliant mathematical physicist, exceptionally capable engineer, and a gentleman of winning personality. He held more than thirty patents, authored one book and numerous papers, and received three major awards for distinguished work in the field of radio engineering. A theorist who put his theories into practical service and an inventor whose inventions were of continuing significance in a rapidly developing industry, Stuart Ballantine was a leader in his field.